Have you ever felt hard of hearing after a night at a concert? Do you have hearing loss after years of working in a noisy environment? Did a sudden loud noise make you lose your ability to hear out of one or two ears? If so, you may have Noise-induced hearing loss. According to the National Institute on Deafness and other Communication Disorders, Approximately 15 percent of Americans between the ages of 20 and 69 have hearing loss that may have been caused by exposure to noise at work or in leisure activities. While the root cause of this type of hearing loss may seem simple, there are many misconceptions about Noise-Induced Hearing Loss. It’s time to set the record straight. MYTH: Noise-induced hearing loss is immediately noticeable – While many people may experience temporary hearing loss after a loud party or concert, a damaged ear may not be immediately noticeable. Often, Noise-Induced Hearing Loss is the result of years of exposure to loud noise, and isn’t noticed until a family member points out common signs of hearing loss. 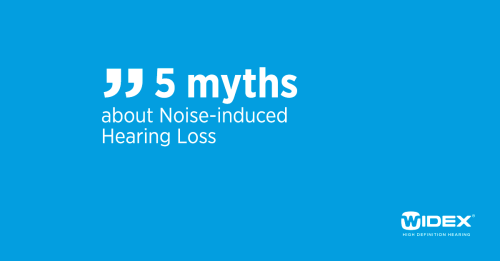 MYTH: Noise-Induced Hearing Loss isn’t permanent – While Noise-Induced Hearing Loss is often is one of few types of hearing loss that CAN go away over time, it is often permanent. Start by resting your ears and giving yourself about 16 hours to recover. If you still experience hearing loss after this time then it is important to see your local hearing professional. MYTH: Noise-Induced Hearing Loss only occurs if you are exposed to loud noises on a regular basis – A One single exposure to explosions, gun shots, loud concerts and other sudden loud noises can all cause noise-induced hearing loss. It is important to wear hearing protection if you anticipate being exposed to loud noise, even if it is just for a short amount of time. MYTH: Only loud music can cause hearing loss – Your profession may be just as risky as your hobbies when it comes to causing hearing loss. Industrial noise is a leading cause of Noise-Induced Hearing Loss. A recent study by the United States Center for Disease Control showed that miners are the most likely people to have this type of hearing loss, due to acoustic trauma from daily noise exposure underground. MYTH: Noise-induced hearing loss is not preventable – Noise-Induced Hearing Loss is the only type of hearing loss that is preventable. Make sure to wear proper ear protection if you anticipate being exposed to loud sounds, even if it is for only a short amount of time. Severe Hearing Loss: What is it? Manan Hearing ©2019. All rights reserved.